This morning at around ten, I happened to glance up at the Clicky Chrome Plug-In, which provides me a real-time count of how many people have visited the site today. To my shock and surprise, it was up well over 300! Normally around this time of day, I was lucky to have 40 or 50. 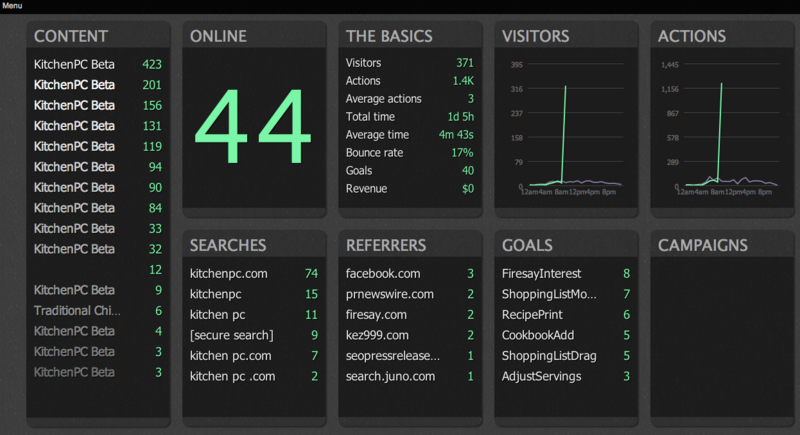 Even more shocking was when I logged on to Clicky and saw there was 44 visitors online at that very moment! This isn’t the first time the site was rewarded with some generous PR or mention in some high-profile blog, but what was strange was that pretty much all the traffic was either direct (people just typing in http://www.kitchenpc.com in their browser) or through a Google search for “KitchenPC” or “KitchenPC.com.” This led me to believe someone mentioned me either on a TV show or on a radio program, which would require users to type in my address rather than click on some link. But who? I soon noticed another trend in the traffic. Over half the visitors were around Phoenix, AZ. 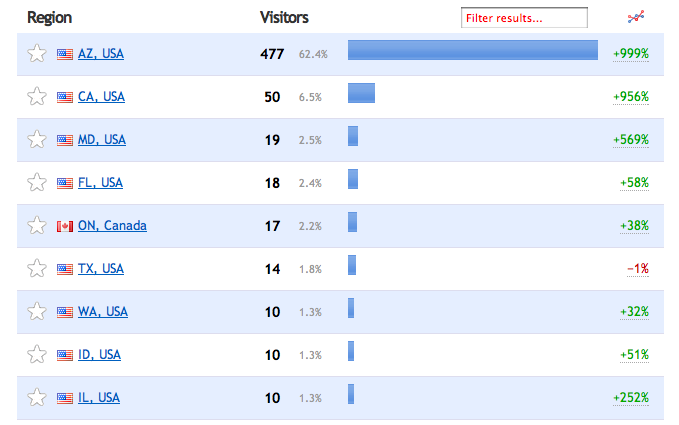 Apparently, my site was all of a sudden famous there. Since the poster was kind enough to leave their email address, I decided to inquire as to which TV show mentioned the site, and it turned out to be a segment on Fox 10, where a local radio DJ shares her “tip of the day.” Today’s tip was that KitchenPC is a fantastic online meal planning tool. That’s a good tip! A quick Google search turned up the video which aired today, which I invite you all to watch. Feel free to fast-forward to around the 5 1/2 minute mark if you’re not exactly obsessed with American Idol. Needless to say, this was a pleasant surprise. I’ve never heard of the show nor was I made aware of this segment in advance. I guess Beth simply stumbled across the site and decided to let her listeners know about it! Though this isn’t perfect timing, as I’m completely re-inventing the site at the moment and thus shy away from too much publicity, it was still completely appreciated. Around 1 in 10 visitors went on to create accounts, and stayed on the site for an average of 5 minutes and 54 seconds with a bounce rate of only 12.9%. For anyone who found the site today, welcome and stick around for exciting new things to come!